"Were the Roaring Twenties really 'roaring'?" Students will gain basic knowledge about social movements in the 1920s by listening to this lesson and participating in the activity. 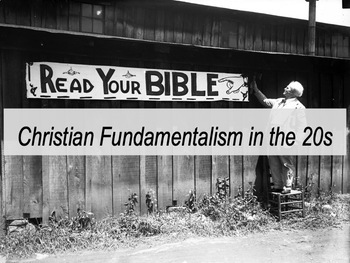 Christian fundamentalism and the Scopes Monkey Trial are both great case studies for the turbulence of the "Roaring Twenties;" this lesson would fit will in conjunction with lessons on the Harlem Renaissance, flapper culture, and Prohibition. After the lesson, students will reenact the dramatic cross-examination of defense lawyer William Jennings Bryan by prosecutor Clarence Darrow. After the reenactment, or as homework, students will summarize the arguments made by both lawyers and assess how they made their arguments. This packet contains a PowerPoint with detailed teacher notes on the theological concepts discussed, a script created from the original trial transcript (1925), and a worksheet. All documents are fully editable. Lesson was created for a 90 minute block, or two 45-minute periods.